15 items. 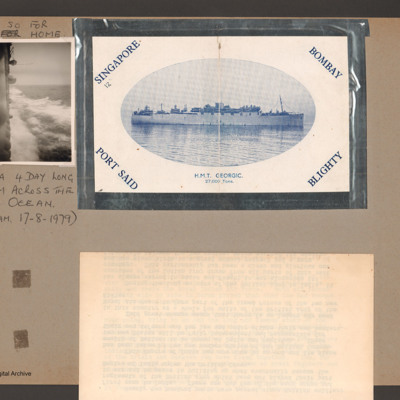 The collection relates to James Henry Banks (b. 1916, 519903 Royal Air Force). He enlisted in the RAF 25 April 1935 and served as a photographer. The collection consists of two multiple page photograph albums, his service and pay book, statement of service and certificate of discharge, a NAAFI pass belonging to his wife, Grace Emily Banks, a pocket watch, loose photographs, and letters regarding his attempt to re-enlist in the RAF between 1948 and 1950. 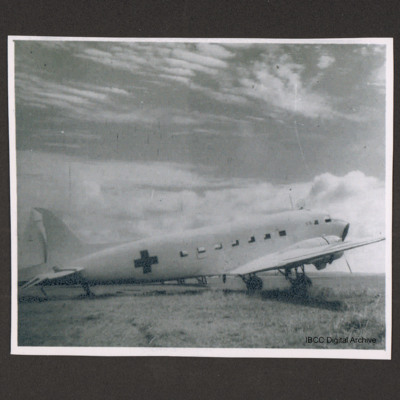 Album one contains photographs pre-war Harts and Harrow aircraft, of the RAF Advanced Air Striking Force in France in 1940, 2 Group aircraft and targets, and a number of aerial photographs of cities and targets in the Ruhr and the Low countries taken at low level during a sightseeing Cooks tour after VE Day. 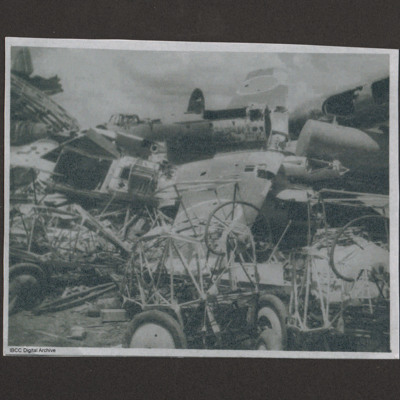 Album two consists of a number of post-war photographs of RAF Seletar, Singapore Burma and Cambodia. 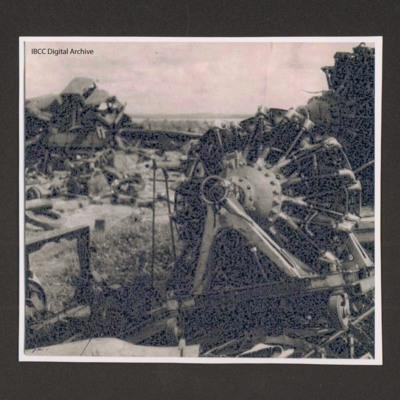 The collection has been loaned to the IBCC Digital Archive for digitisation by Peter Banks and catalogued by Barry Hunter and Nigel Huckins, with further identification kidly provided by the Archeologi dell'Aria research group (https://www.archeologidellaria.org). Pocket watch owned by Peter Banks's grandfather. Case marked 'ARGENTAN'. 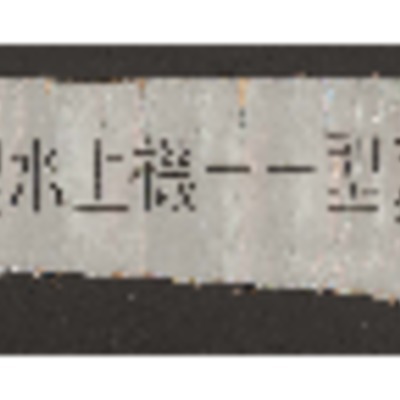 A small piece of scrap with a message in Japanese. 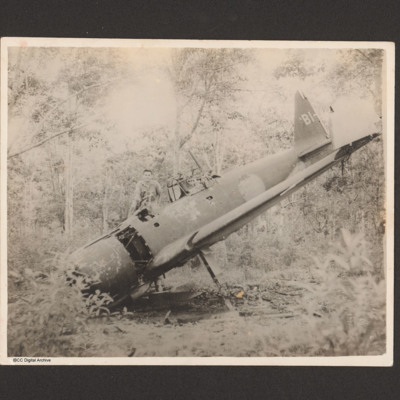 Captioned on the reverse 'A6M3 model 22?' 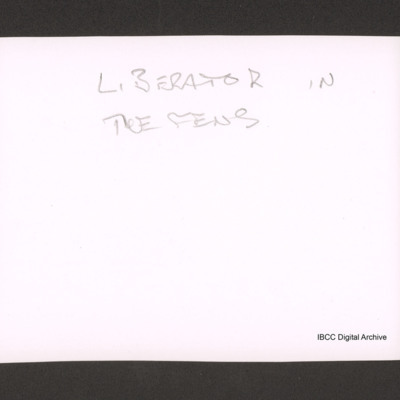 On a separate sheet is 'Translation Material possible from scrap yard zero. A6M Model 22? "Small above water warrior model type 1100"'. The aircraft was found in the jungle close to Seletar camp. It has nosedived into the ground. One man is standing by the cockpit. On the tail is code B1. The wing tip is hinged upwards. 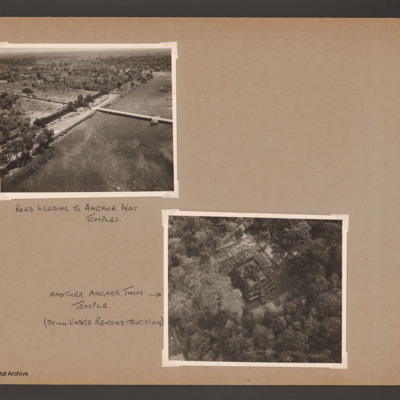 Photograph 1 is an oblique of a road across a lake captioned 'Road leading to Angkor Wat temples'. 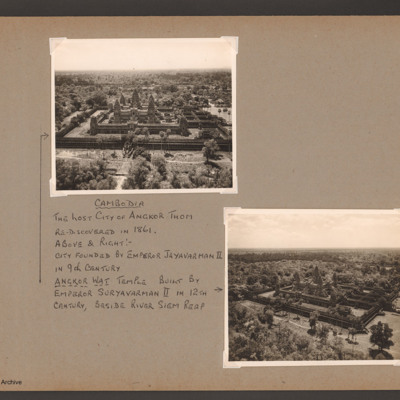 Photograph 2 is a near vertical view of a temple captioned 'Another Angkor Thom temple (still under re-construction)'. Photographs 1 to 6 are of rocks with waves crashing over them. Photograph 7 is of two airmen on rocks by a stream. 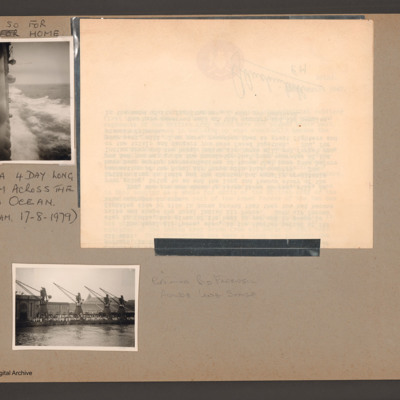 Photographs 8 and 9 include three airmen on rocks by the sea. 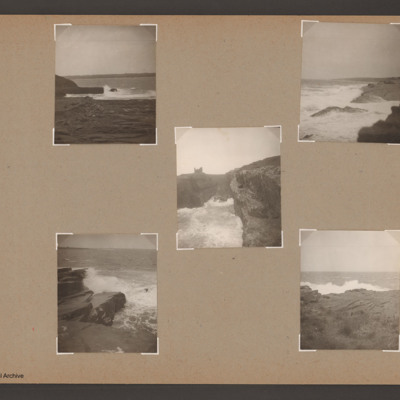 Photographs 10 to 12 are seascapes with waves crashing over rocks. 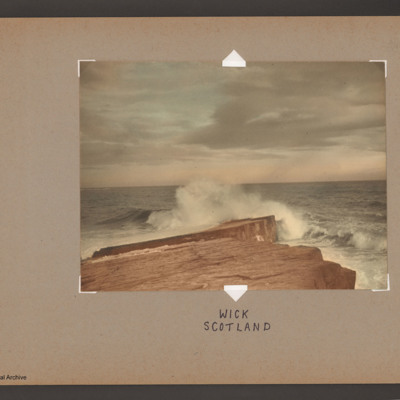 All photographs show rocks with waves crashing against them. Oblique aerial photograph of a rocky headland. A rock outcrop with waves crashing on it. 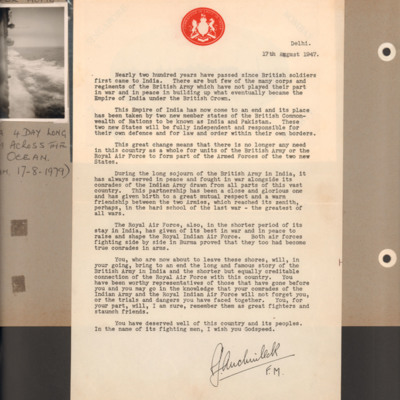 A letter from Field Marshall Claude Auchinleck to British forces serving in India. It thanks the forces for their service and wishes them Godspeed. 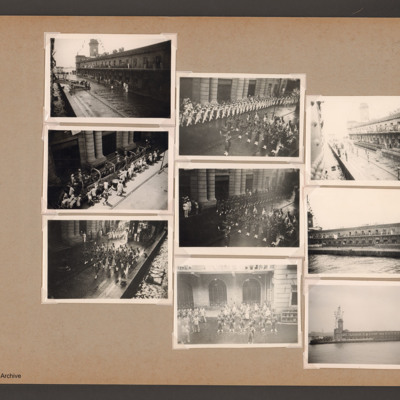 All photographs taken from the side of the ship showing people and marching soldiers on the dockside. Nine photographs taken from the ship looking down on people on the dockside. Photographs 1 and 2 are from the deck looking down at people on the quayside. Photograph 3 and 5 are a clock tower at the dockside. 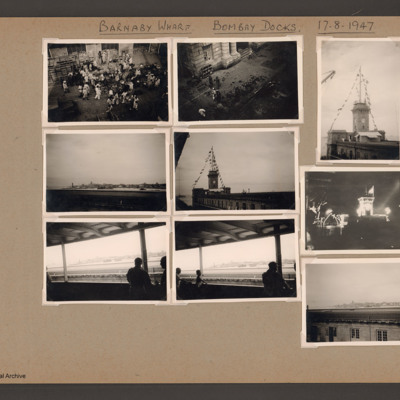 Photograph 4, 7, 9 and 9 are views of the docks. 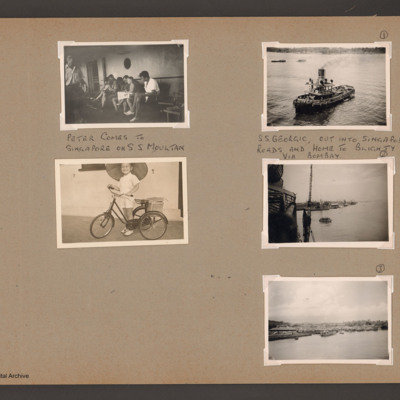 Photograph 1 is a people including Peter and his mother on the deck of a ship. Photograph 1 is an aerial view of a ship captioned 'Japanese flak-ship'. Photograph 2 is a dockside with a Loire 130 and several Aichi E13A seaplanes and a floating crane. 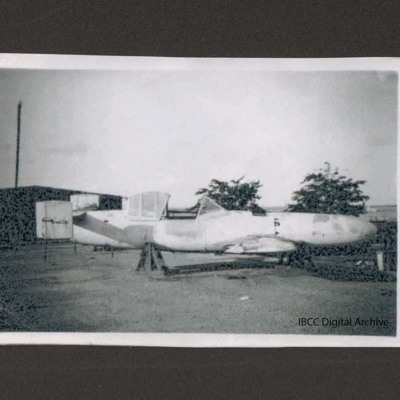 Captioned 'Japanese sea planes'. Photograph 1-4 are a man, woman and child with packing cases. Photograph 5 shows landing craft at the dockside. Captioned 'Landing craft at Seletar RN base'. Photograph 1 is the married quarters. Photograph 2 is three women and Peter in the garden. Photograph 3 is a man pushing a bike up a path. Photograph 4 is the married quarters. Photograph 5 is a man on a path.